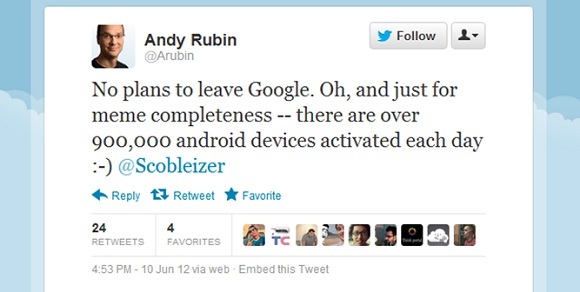 Andy Rubin, the founder of Android, who sold the platform to Google back in 2005 has announced on Twitter that the daily activation of Android enabled devices has reached a grand 900,000 devices per day. Now this number is indeed huge and which goes on to mean that roughly 625 Android devices are activated every minute. Back at the MWC 2012, Rubin had announced that every day 850,000 devices were activated during that period in February and now the 900,000 devices not a huge increase but indeed it is good to see the numbers rising. Andy Rubin while announcing this stat on Twitter was actually clarifying a rumour which was doing the rounds, suggesting that he was going to leave Google to be a part of a startup called CloudCar. But now he has rubbished all rumours and said that he has ‘No plans to leave Google’. This is indeed a very logical decision. Android was developed by him and he fathered the OS with Google and now it is so popular that he wouldn’t even think of leaving the search engine giant anytime in the near future.